Complete understanding of the master of masters [Mozart] ... McLaren’s sonorous touch was a joy; his runs sparkled delicately without insistence. Technically he was so sovereign that he was able to play relaxed and full of delight… Altogether this was simply beautiful! The young New Zealander was able to win over the musical side of the G major piano concerto K.453 by Mozart, with a sparkling, controlled touch. Abstaining from “big gestures” at the keyboard, he breathed life into the piece with small, logical rubati. The orchestra obeyed by giving its time and attention to the pianist. The audience was filled with enthusiasm. The performer of his own opus completely opened up, sparkling with brilliant runs, thundering chordal passages, and pretty, lyrical melodies. The strong individuality of the piano accompaniments in the “Müller Songs,” too, was well portrayed by the New Zealand pianist. There were charisma, naturalness and a direct approach … The piece as a whole required the touch of one able to master the ephemeral. McLaren had this ability to make the fleeting glimpse tell. In Mozart’s A major sonata, Marcus McLaren demonstrated precision and a technique which we witness only too seldom here. His explanatory descriptions of the work’s history and the characteristics of the fortepiano in Mozart’s time increased the audience’s attention and relaxed the atmosphere. 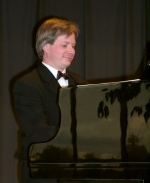 Marcus McLaren’s simple direct style of piano playing captivated a large audience … McLaren demonstrated a formidable technique, playing with confidence and flair. It was a stylish performance, and a welcome change from the more usual romanticised approaches to Haydn’s sonatas. A pianist not to be missed in future... Showing lyrical beauty and subtle intellectuality ... Far-ranging beauty and depth of feeling led to an inexpressibly lovely conclusion… Sparkling runs, hurtling octave passages and thundering chords marked a magnificently dramatic execution of Liszt’s Sonata in B minor… [A] stunning concert. McLaren, resident in Germany, returns to New Zealand each year for concerts which have been among the more dramatic and innovative of recent years. McLaren [is an] expressive accompanist. He explained and performed Liszt’s Ballade in B minor so directly and expressively that the audience was stunned to silence for seconds before applauding.